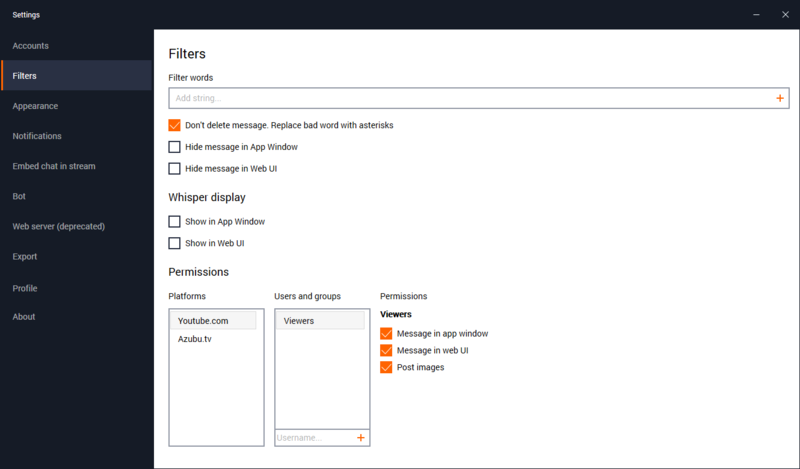 The Restream Chat can be broken down into three major parts; Filters, Whisper Display, and Permissions. Each can be used to make the Restream Chat a better reading experience for both the streamer and their chat. This section is used for basic filtering of words and phrases from your chat room. Filter Words: Here is where you can add each word or phrase you'd like to be filtered from your chat. Hide message in Web UI: Choosing this Radial Menu will hide your filtered messages from the Web UI (The part you embed in your stream. Most streaming services don't use a Whisper Service and so a lot of users don't use this option. However, if you are streaming on a website like Twitch, you may be wanting to control who can see your whispers and this category provides that. This allows you to take control of all the chatters in your channels and setting specifics permissions to them. Each platform has the ability to add user groups which define groups or specific names.